So many people have sent me this fabulous photo, I felt obligated to post it, along with some commentary below. 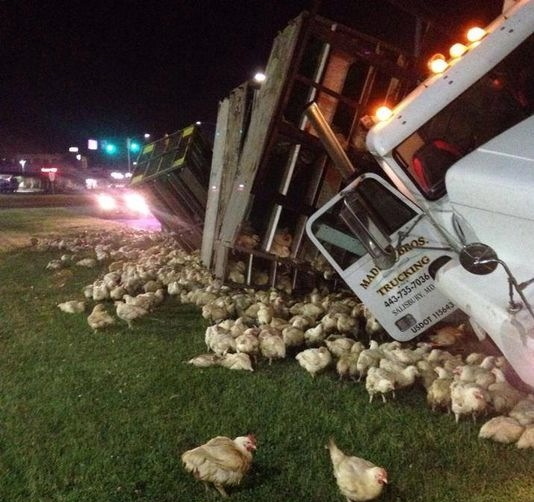 Chicken truck overturns near Dover, DE. Photo by Delaware News Journal. These kinds of accidents happen every year and its big news. Why? Because the modern broiler industry developed in I wrote about its origins in my book The Discreet Charms of a Bourgeois Beach Town. Here how it began…. Back in 1923, a short, heavyset, farm wife with red hair and fiery temper named Cecile Steele raised a flock of laying chickens to help support her family. Each year she would order fifty new chicks to replace losses in her flock. In 1923, she was mistakenly sent five hundred. She sold the excess to a local chicken buyer who then shipped them to New York restaurants and hotels. It proved profitable and the next year she ordered a thousand chicks. Her husband quit his Coast Guard job, and they began building chicken houses and raising birds full-time. News of their success spread, and others in Sussex County began raising their own flocks solely for meat. I should point out that in the 1920s, chickens were raised primarily for eggs. Chickens were more expensive than other meat, and Americans who did eat chickens consumed young male cockerels culled from laying flocks or tough old hens. The pressing need for a new source of agricultural income helps explain why so many Sussex County farmers were willing to raise chickens. Fruits and vegetables were always at risk for freezes and blights. Some other factors helping spur the growth of the industry included Delaware’s relatively mild climate, cheap building costs, low labor costs, close proximity to major urban markets, a good system of public roads, and a willingness of banks to provide easy credit. It was World War II, however, that led to dramatic growth. Chickens moved from birth to slaughterhouse much faster than cattle or pigs. Chickens fed the American army. Chickens fed hungry Europeans. So much money was being made raising chickens in Delaware that attorneys, politicians, and other white-collar types began raising birds. Southern Delaware continues as a hot bed of chicken farming. Sussex County leads all the nation’s counties in broiler production.